The American Society of Digital Forensics and Electronic Discovery is a not-for-profit association of digital forensics and electronic discovery professionals. Our organization is dedicated to providing the highest quality of educational materials and training to the community at a reasonable price. Our motto represents our core beliefs: Servitium Scientia Integritas, which means means: Service, Knowledge and Integrity. ASDFED’s seal is a point of organizational pride. A significant number of hours were expended in it’s conception and creation. Each point, position, and inference was given great consideration and chosen with care. The seal was commissioned in 2008. The seal has two concentric circles with separated edges. 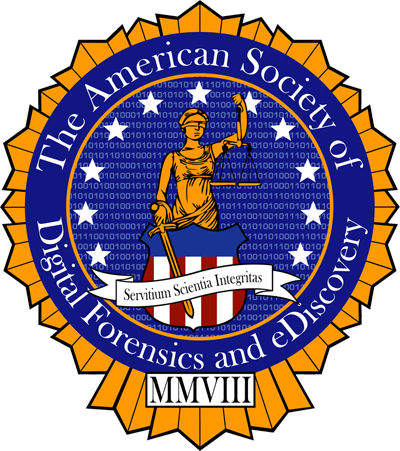 The words “The American Society of Digital Forensics and eDiscovery” appear within the outer most circle on a navy blue background. The Roman goddess Justitia appears within an inner circle on a binary background. She is holding a sword and set of scales and is protected by a red, white, and blue shield. United States of America . She is blindfolded to represent her objectivity. Justitia appears on a circular binary background. This represents the endless application and evolution of digital technology on the modern world and the impact of the law upon it. Justitia is surrounded by 11 stars. The stars are representative of our discipline’s 11 domains of knowledge. The foil edging represents the light of the sun as our discipline is used to illuminate the truth. The Roman numerals MMVIII represent the year the organization was formed, 2008. ASDFED’s motto is inscribed on a banner with the words “Servitium Scientia Integritas.” This can be translated from Latin as Service, Knowledge and Integrity. 1. Gold is a precious metal and symbolizes the value this organization brings to the profession. 2. Blue is the most common color on the earth and is a symbolic universal application of technical and the protection this organization brings to profession. 3. Red is a primary color and consists predominantly of the longest discernible wavelengths of light visible to the human eye. It symbolizes courage and sacrifice. 4. White is an achromatic color, which reflects all visible light within the spectrum and symbolizes purity.